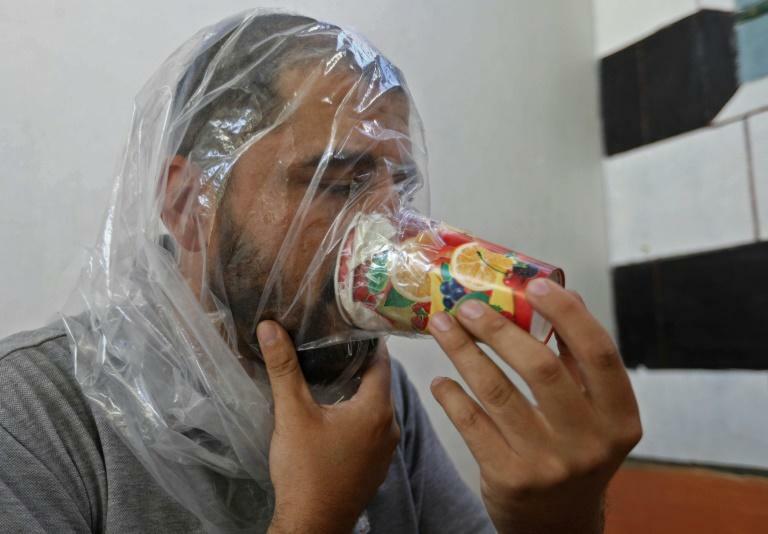 Fearing the worst in the looming battle for Syria's last rebel stronghold, one desperate father is doing everything to protect his kids -- fashioning gas masks from paper party cups and plastic bags. Hudhayfa al-Shahhad, who lives in the northwestern province of Idlib, is determined he and his family will be ready as best as possible for any chemical weapons attack, and has even dug a cave under his home to sit out any bombings. "I learnt how to make them on YouTube," says the 27-year-old policeman demonstrating the rudimentary homemade masks, which he hopes may spare his three young children from the potentially deadly effects of any gas attack. Sitting cross-legged on a cushion in his home in the southern village of Maar Shurin, he pricks the bottom of a brightly coloured paper cup with a pin. As his daughter peers over his shoulder, he pushes medical gauze down into each cup gaily decorated with pictures of mangoes, bananas and other fruit. Next he heaps in several spoonfuls of charcoal, some cotton wool, and then another layer of gauze so the wearer does not breathe in any of the black dust. Shahhad uses sellotape to seal it all in, snips a dent into the top of the cup where the wearer can place their nose and then tries breathing through it. As he inhales, tiny arms clad in gold bangles wrap themselves around his neck, and his two-year-old daughter tries to clamber onto his back. When she sits down, he passes her the makeshift carbon filter. "Here, put it on your mouth," he tells the green-eyed, curly haired toddler, sporting a bright pink T-shirt. He, like his neighbours, has been increasingly concerned by reports that Russia-backed regime forces have massed around Idlib in recent weeks, sparking fears of an imminent air and ground attack to retake the last major opposition bastion. "We've been hearing the regime and Russia threaten to bomb us with chemical weapons," says Shahhad. "We had to make these masks to protect our women and children just in case," he says. For a final touch, Shahhad places the cup-shaped filter into the snipped corner of a large translucent plastic bag. He helps his three-year-old son don the mask. He clutches the cup with his small hand, while the plastic bag covers his whole face and shoulders. On Tuesday, Moscow claimed that the rebels, who have been fighting to topple Syrian President Bashar al-Assad since 2011, had begun working on staged film footage to try to claim to the world that an alleged chemical attack has taken place. Throughout the seven-year war which has claimed more than 350,000 lives, the Syrian regime forces have repeatedly been accused of carrying out chemical attacks, mostly with chlorine but also with deadly sarin nerve gas, on rebel-held areas. The regime and Russia have consistently denied the accusations, blaming opposition fighters instead. But international investigators have found that on at least three occasions the regime unleashed chemical weapons on civilians, while the so-called Islamic State group was also blamed for using mustard gas. The homemade DIY masks are catching on. 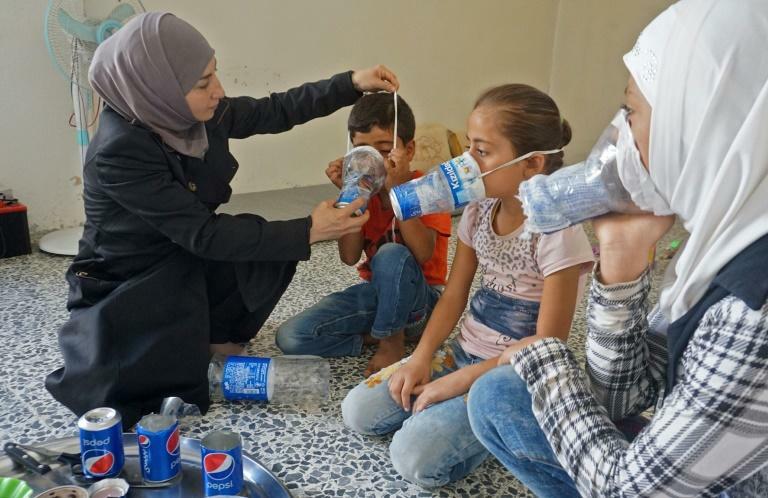 In the town of Binnish, in Idlib, Um Majid has also used soft drinks cans and bottles to make her own devices for her family. In April last year, more than 80 people were killed in Idlib's town of Khan Sheikhun after toxic gases hit the town. This year in April, an alleged chemical attack on the then rebel-held town of Douma outside Damascus took the lives of more than 40 people, medics said. After the gas assault, the regime swiftly took back the surrounding area under a Russia-brokered surrender deal. Shahhad is also making sure he and his family can take shelter underground from any air strikes. Carrying a torch, he leads the way down steps from his basement and into a cavernous shelter dug out of the grey rock. Large jars of pickled cucumbers have been lined up in the gloom, beside a mattress on a wide seat made of bricks. "We've been digging this shelter since 2012 because of the bombardment, but we started working again on it after the threats," he says, clutching his one-year-old daughter on his lap. "The houses above can't withstand the bombing," he says.